We have known George for over 20 years. Before coming to work for Salit Auto he was in the auto business for over 15 years. His love and knowledge of cars is what makes him invaluable to us. When we needed to add on a service writer we knew who we wanted. You can find George in the garage streamlining the process for the vehicles that need repair as well as talking to customers on the sales side for Salit Auto Sales. 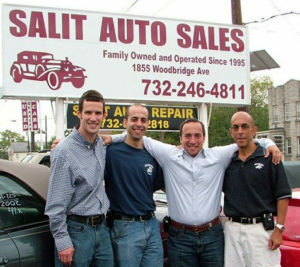 In other words, George is the liaison in between Salit Auto Repair and Salit Auto Sales. At many other dealerships the sales person that you may deal with today maybe gone tomorrow. That means, all the promises made to you may have left as well. This is a very common problem being that the auto industry has a very high sales person turnover rate. There are times that sales people will deliberately fabricate stories about a car’s history knowing full well that they are only looking to make a quick buck. This maybe in contrast to the company owner’s vision of how he/she would like to do business. Never the less, the buyer ends up with the short end of the stick either with a bad deal or with long and short term promises that can not be upheld. Proudly served the Central New Jersey area since 1995.